The court is composed of eleven active judges and is based primarily at the Thomas F. Eagleton United States Courthouse in St. Louis, Missouri and secondarily at the Warren E. Burger United States Courthouse in St. Paul, Minnesota. It is one of thirteen United States courts of appeals. 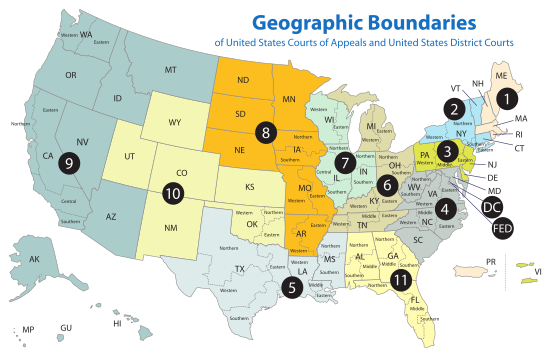 In 1929 Congress passed a statute dividing the Eighth Circuit that placed Minnesota, Iowa, North Dakota, South Dakota, Nebraska, Missouri, and Arkansas in the Eighth Circuit and created a Tenth Circuit that included Wyoming, Colorado, Utah, New Mexico, Kansas, and Oklahoma. 9 Robert E. Lewis CO 1857–1941 1921–1929 — — Harding reassignment to 10th Cir. 13 John Hazelton Cotteral OK 1864–1933 1928–1929 — — Coolidge reassignment to 10th Cir. Chief judges have administrative responsibilities with respect to their circuits, and preside over any panel on which they serve unless the circuit justice (i.e., the Supreme Court justice responsible for the circuit) is also on the panel. Unlike the Supreme Court, where one justice is specifically nominated to be chief, the office of chief judge rotates among the circuit judges. To be chief, a judge must have been in active service on the court for at least one year, be under the age of 65, and have not previously served as chief judge. A vacancy is filled by the judge highest in seniority among the group of qualified judges. The chief judge serves for a term of seven years or until age 70, whichever occurs first. The age restrictions are waived if no members of the court would otherwise be qualified for the position. When the office was created in 1948, the chief judge was the longest-serving judge who had not elected to retire on what has since 1958 been known as senior status or declined to serve as chief judge. After August 6, 1959, judges could not become or remain chief after turning 70 years old. The current rules have been in operation since October 1, 1982. The court has had thirteen seats for active judges. Two of these seats were reassigned to the United States Court of Appeals for the Tenth Circuit, leaving a eleven-seat court. The seats are numbered in the order in which they were filled. Judges who retire into senior status remain on the bench but leave their seat vacant. That seat is filled by the next circuit judge appointed by the president. ^ "Tenth Circuit Act of 1929". Official website of the Federal Judicial Center. Archived from the original on 2006-09-26. Retrieved 2006-10-20. ^ Caldwell was appointed as a circuit judge for the Eighth Circuit in 1890 by Benjamin Harrison. The Judiciary Act of 1891 reassigned his seat to what is now the U.S. Court of Appeals for the Eighth Circuit. ^ Recess appointment, confirmed by the United States Senate at a later date. ^ Carland did not have a permanent seat on this court. Instead, he was appointed to the ill-fated United States Commerce Court in 1911 by William Howard Taft. Aside from their duties on the Commerce Court, the judges of the Commerce Court also acted as at-large appellate judges, able to be assigned by the Chief Justice of the United States to whichever circuit most needed help. Carland was assigned to the Eighth Circuit upon his commission. "Standard Search". Federal Law Clerk Information System. Archived from the original on October 21, 2005. Retrieved June 10, 2005. "Instructions for Judicial Directory". Website of the University of Texas Law School. Archived from the original on November 11, 2005. Retrieved July 4, 2005. "U. S. Court of Appeals for the Eighth Circuit". Official website of the Federal Judicial Center. Archived from the original on May 2, 2005. Retrieved June 10, 2005.